I have a sick 'Sprout' at home today, and she's ordered that I not cook anything that "smells like food" (which pretty much means 'stay out of the kitchen' I guess). So I've resorted to simply LOOKING at my files of food pictures on the computer, and catching up on a few recipes I should have posted ages ago. This recipe, for basic, easy and fluffy biscuits, is a favorite for breakfast, with gravy, (yes, everything needs gravy, haven't you learned anything reading this blog yet?). I also use it as a rustic "shortcake" layer when making Strawberry Shortcake (which should be happening soon!) or to top fruit for cobbler. 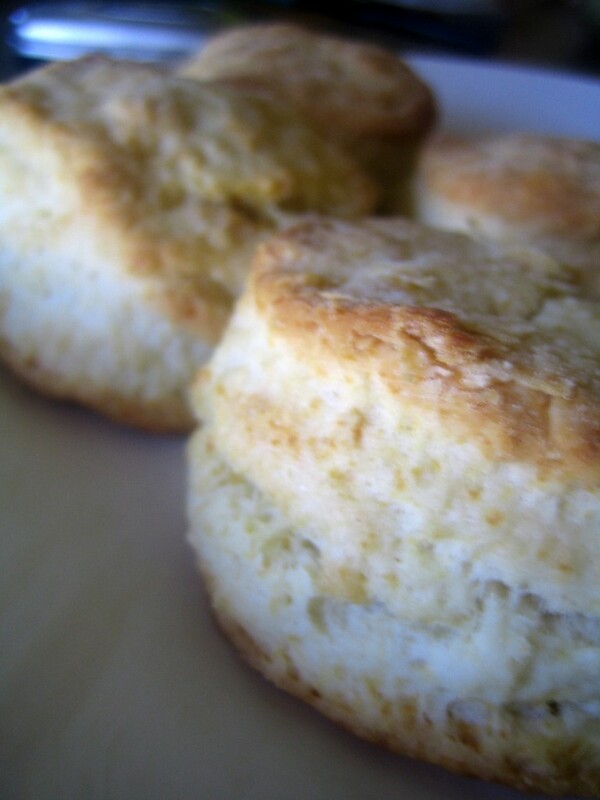 Biscuits are versatile and go together fast. Once you've made them a few times, you'll be adding them to your dinner (or breakfast) often! No, they're not the epitome of health-food. Stop reading my blog if that's all you eat. They ARE a perfect warm, cozy (and cheap!) way to fill out a meal. Enjoy. Mix lemon juice into coconut milk and set aside. It should begin to "curdle" in 5 - 10 min, but even if it doesn't, it still works here. Heat oven to 450° F. Lightly grease baking sheet. Place flour and wheat germ in a large bowl. With pastry blender or two knives, cut Earth Balance into flour until mixture resembles coarse crumbs. Add milk; stir with a fork just until soft dough forms and mixture begins to pull away from sides of bowl.Do NOT over-stir. Turn out onto lightly floured surface and knead gently about 10 times. Pat out to about 3/4 inch thick. The less you handle the dough, the fluffier the biscuits will be! Cut with floured 2-inch cutter. Cut straight down, do NOT twist the cutter. Place on greased baking sheet with sides touching. Bake at 450° F. for 10 to 12 minutes or until golden brown. Enjoy with margarine, jam, syrup, on top of pot-pie or cobbler, or, of course, gravy! These fluffy biscuits look absolutely delicious! Thank you so much for sharing the recipe. We're certainly going to be making these at home! If you use regular flour, add 1 tbsp baking powder for 2 cups flour. You may also want to aadd 1/2 tsp salt. Works well with soy, almond or coconut milk.